Finn the Fortunate Tiger Shark is a story of fun, friendship and how we can all help to keep our ocean friends happy and healthy. The story has a strong but upbeat message for children about the impact of ocean plastic on our marine life and includes an A-Z with lots of ideas for children to try to reduce their use of plastic. Be the Change Books are a series of children's books about environmental issues, each with a funny story and clear pointers to what we can all do to make the world a better place. 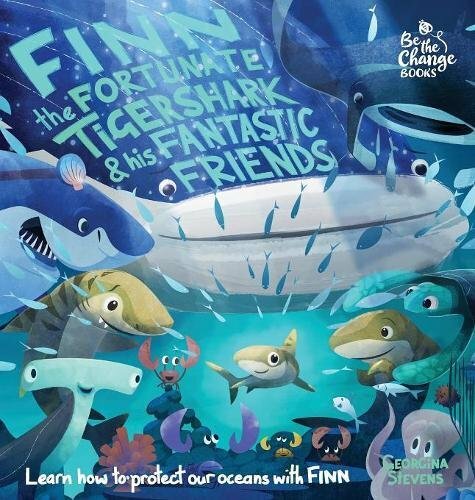 Finn the Fortunate Tiger Shark and his Fantastic Friends is the first in the series, and focuses on the sticky issue of plastic in our oceans. The story has a strong but upbeat message for children about the impact of ocean plastic on our marine life and includes an A-Z with lots of ideas for children to try to reduce their use of plastic. This fun and educational book was written by Georgina Stevens. Georgina has worked in sustainability for over twenty years. She has helped many organisations to understand what they can do to make the world a better place. She is also a writer, environmental campaigner, cyclist, mum and a lover of sharks. Tom Baker is a London based character animator and illustrator who’s worked on lots of things you might have watched on TV. He runs an animation studio, Kong Studios, with his friend Bill and when he’s not drawing animals he’s probably drawing trains. 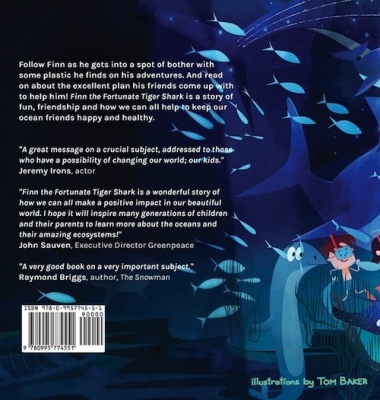 Finn the Fortunate Tiger Shark and his Fantastic Friends is a humorous short story about a popular tiger shark who gets into a spot of bother from eating too much plastic, and is saved by his friends thanks to their ingenious plan. Recommended age range: 3 - 6 years. However, this book will inspire any child and their parents. “When I was a small person, the planet and all its wonderful creatures weren’t seen to be at risk. Now they are – to a quite horrendous extent. And young people today are really focussed on issues like ocean plastics, needing both the facts and the reasons to be hopeful. Georgina Stevens’s wonderful new book provides both – with humour, insight and a powerful call to arms.” Jonathon Porritt, Founder Forum for the Future.